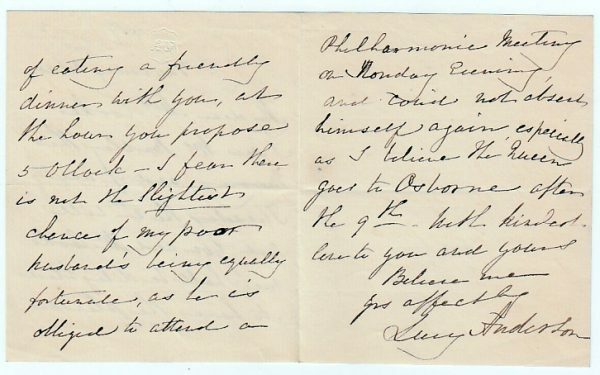 Autograph Letter Signed, to Mrs. Cooke, arranging ‘a friendly dinner’, mentioning that her husband (who was Master of the Queen’s Music) would be unable to attend, in part because ‘I believe the Queen goes to Osborne after the 9th’. 3 pp. 4 x 3.5 inches, fine. 28 October [no year]. Lucy Anderson (1790-1878) taught the piano to Queen Victoria and her children. She was the first female pianist to play at the concerts of the Philharmonic Society.